Many people think that cleaning coins will increase their value. After all, shiny and bright coins are beautiful. When the coin leaves the mint after just being struck, it has a shine or luster. The original mint luster is gradually destroyed as a coin circulates through commerce. Cleaning a coin will also remove the luster thereby destroying the original surface characteristics. Some of the most common questions asked by new coin collectors are "How do I restore the shine to my coins?" and "How can I clean my coins to make them shiny again?" The technical term that numismatists used to refer to the shine that new coins have is called mint luster. When the coin dies come into contact with the planchet under extreme pressure during the striking process, this creates the mint luster on the surface of the coin. This process causes changes to the metal of the planchet at the molecular level. The metal of the planchet is forced, by the great striking pressure, to flow into the recesses of the coin die and also against the flat surfaces of the dies and against the edges of the collar, which produce the reeded edge we see on certain coins like dimes or quarters. The exception to this rule is ancient coins that are at least 1,000 years old. Since banks did not exist back then, people tended to store their coins in inconspicuous places. Most of these places involved being buried in the ground. After hundreds of years of being buried, it is acceptable to remove the dirt by cleaning the coins properly. A Shiny, Never Cleaned Coin Can Do Cartwheels! As a result of the metal flowing into the recesses of the coin die at extremely high pressure, a unique event occurs. A by-product of the coin manufacturing process is that the coin will acquire a beautiful and lustrous shine. The precise cause of the coin's shiny surface, or mint luster, is what we call flow lines. Flow lines are microscopic patterns in the metal where the molecules have been forced to line up in certain ways. These flow lines are easier to see on larger coins than on smaller ones. Morgan Dollars were nicknamed cartwheels when they first came out, partly because the flow lines caused the appearance of a turning windmill when the coin was tilted at different angles to a light. The other reason Morgans were called cartwheels was a derogatory term for their large size and heaviness. Morgan Dollars were quite unpopular when they first came out. In fact, people disliked them so much that you could still get them in mint condition with dates in the 1800s right from banks until the early 1960s! The story of the history of the Morgan silver dollar is truly fascinating and at times incredible! To see the amazing cartwheel effect, take any newly minted coin which is uncirculated (you probably have a few in your pocket change right now) and tilt the coin to the light, watching the band of the "cartwheel" to rotate around. It is much easier to see this effect on the obverse (head's side of the coin) than the reverse side because there is usually more flat space, called the field, on the side with the portrait. Also, the larger the coin, the easier it is to see the cartwheel effect, and the better it rotates. Why Is Not Cleaning Your Coin so Important? It is important to understand how the minting process creates the cartwheel effect, and how you can see it for yourself because the cartwheel effect gives us a good indication of the surface condition of the coin. Specifically, whether someone has cleaned the coin or not. The state of preservation of the surface of the coin has become a critically important element in judging the value of the coin. Cleaned coins have a significantly reduced value. If a silver coin bears a common date in the twentieth century (1900 to 1964) and has been cleaned, most dealers will weigh them on a scale and pay you a small premium over bullion value. If you send common-date cleaned coin from the twentieth century to a top-tier grading service, it will probably come back to you in a "genuine holder" without a grade, and you will have wasted your money trying to get it slabbed. It is important to remember that cleaning a coin is a definite way to destroy the surface of a coin, along with a good portion of the coin's value. In all fairness, grading services do make occasional exceptions regarding the cleaning rule, especially for coins that are so rare that people are glad to acquire one despite the damaged surface. On coins of the nineteenth century and earlier (dates in the 1800s and before,) the grading services are also more lenient about cleaned coins, but only if the coin was cleaned many, many years ago. If I clean my dirty and ugly coins, how can this possibly hurt them? Once again, we're back to our cartwheels, which is our demonstration of the state of preservation of the surface of the coin. For example, silver coins will tone, or tarnish, as a result of the silver molecules interacting with elements in the environment. As you will see with a tarnished silver coin, you have lost your cartwheel effect, and the surface of the coin itself will have suffered some damage. However, despite these changes, the surface of your coin is usually still intact, which you can easily verify under magnification. The coin hasn't yet lost much value, because the surface is still intact, the way it left the mint. In fact, some toning is considered to be very beautiful, and an enhancement to the value of the coin! But one thing is nearly certain, if you clean a coin to remove tarnish or toning, you will damage the surface of the coin. Some methods of cleaning metal use an acid "dip" for cleaning. This is a process where you dip the coin in a mildly acidic solution for a brief time and then wash it off. This method is one of the least damaging since it usually just strips a layer or two off the surface of the coin. Unfortunately, this includes the fragile flow lines which give the cartwheel effect. Dipping also leaves the surface dull and ugly. Another good way to damage the surface of your coin is to use an abrasive cleaner. These come with names like Wright's Silver Polish and consist of a paste or cream. You rub the product into the coin's surface until you have removed all the toning. Unfortunately, this process will also remove the flow lines, the cartwheel effect, a great number of molecular layers of the coin's surface itself, and a good portion of the coin's value. 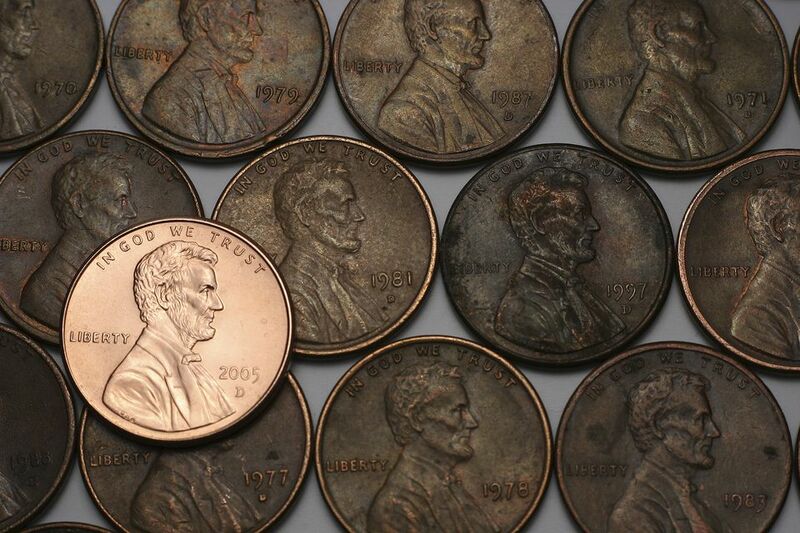 The bottom line is that you should almost never clean your coins. About the only time I can think of that it might be appropriate to consider cleaning a coin would be if you dug up a rare U.S. 1804 silver dollar with the help of a metal detector! Then I think, because of the coin's extremely high value and rarity, it might be worth sending it off to someone like the Numismatic Conservation Service to have it professionally cleaned.